On Monday 22nd April 2019 the sun will rise at 05:41 and will set at 20:05. It will be a mild day, with temperatures reaching around 17.4°C. Today is expected to be a dry day, with a very low chance of rain. It will be quite a breezy day, with a maximum expected wind speed of 30mph. On Tuesday 23rd April 2019 the sun will rise at 05:39 and will set at 20:07. It will be a mild day, with temperatures reaching around 14.7°C. Today is expected to be a dry day, with a very low chance of rain. It will be quite a breezy day, with a maximum expected wind speed of 35mph. On Wednesday 24th April 2019 the sun will rise at 05:37 and will set at 20:09. It will be a mild day, with temperatures reaching around 17.7°C. Today is expected to be a dry day, with a very low chance of rain. It could be quite a gusty day today, with a maximum expected wind speed of 27mph. On Thursday 25th April 2019 the sun will rise at 05:35 and will set at 20:11. It will be a mild day, with temperatures reaching around 14°C. A few showers are expected, 4mm of rainfall is possible today. Some quite strong winds are possible today, with a maximum expected wind speed of 32mph. On Friday 26th April 2019 the sun will rise at 05:33 and will set at 20:12. It will be a mild day, with temperatures reaching around 14°C. Today is expected to be a dry day, with a very low chance of rain. There could be quite a strong breeze in the air today, with a maximum expected wind speed of 26mph. On Saturday 27th April 2019 the sun will rise at 05:30 and will set at 20:14. It will be a mild day, with temperatures reaching around 10.1°C. Some moderate to heavy rain is expected, 5mm of rainfall is possible today. Some quite strong winds are possible today, with a maximum expected wind speed of 49mph. On Sunday 28th April 2019 the sun will rise at 05:28 and will set at 20:16. It will be a mild day, with temperatures reaching around 14°C. Some moderate to heavy rain is expected, 6mm of rainfall is possible today. It will be quite a breezy day, with a maximum expected wind speed of 19mph. On Monday 29th April 2019 the sun will rise at 05:26 and will set at 20:18. It will be a mild day, with temperatures reaching around 11.4°C. Today is expected to be a dry day, with a very low chance of rain. It will be quite a breezy day, with a maximum expected wind speed of 17mph. Explore the quiet countryside around the Norfolk Broads on two wheels. Hire adult and child bikes, tag-along trailers, child seats and tandems. Helmets, locks, pumps provided. Free route maps. Our hire centre is located in the car park at BeWILDerwood off the A1062 between Hoveton and Horning (BeWILDerwood entry not required). We have a large range of cycles for hire - including children's sizes, tandems, 'tag-alongs', trailers and baby seats. There are free route maps available at each centre and you can enjoy pleasant cycling along quiet country lanes around the Broads - Britain's Magical Waterland, with pubs, cafes and attractions along the way. 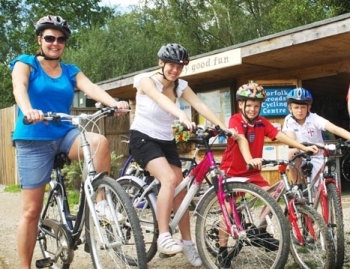 There is also access to the Bure Valley Cycleway - a 9 mile off-road trail alongside the Bure Valley steam railway.